1969 was a magic time: Woodstock, and a man on the moon. It was also the summer of the Miracle Mets. New York’s lovable losers went from last to first in a historic season — capped by a seemingly impossible victory over the mighty Baltimore Orioles in the World Series. Fifty years ago too, Stew Leonard’s store was opening. At Staples High School, students like my classmate Phil Gambaccini raced home from school to catch portions of the fall classic (World Series games were played during the day back then). Yesterday, 6 members of that 1969 Mets team signed autographs at Stew Leonard’s. They were celebrating both the 50th anniversary of their world championship, and the store’s 50th. Phil Gambaccini recently moved back to Westport, after many years abroad. He was at Stew’s yesterday, of course. In the photo below, Ed Kranepool (center) and Art Shamsky autograph a ball for him. Other Met legends in Norwalk were Ron Swoboda, Cleon Jones, Jim McAndrew and Duffy Dyer. The line for autographs snaked through the store and into the parking lot, for several hours. Near the end players moved through the line, shaking hands with fans (many as gray as the Mets), and handing out pre-autographed sheets of paper. Most of the Mets — notably Shamsky, 77 — looked close to playing form, or at least fitter than many fans. 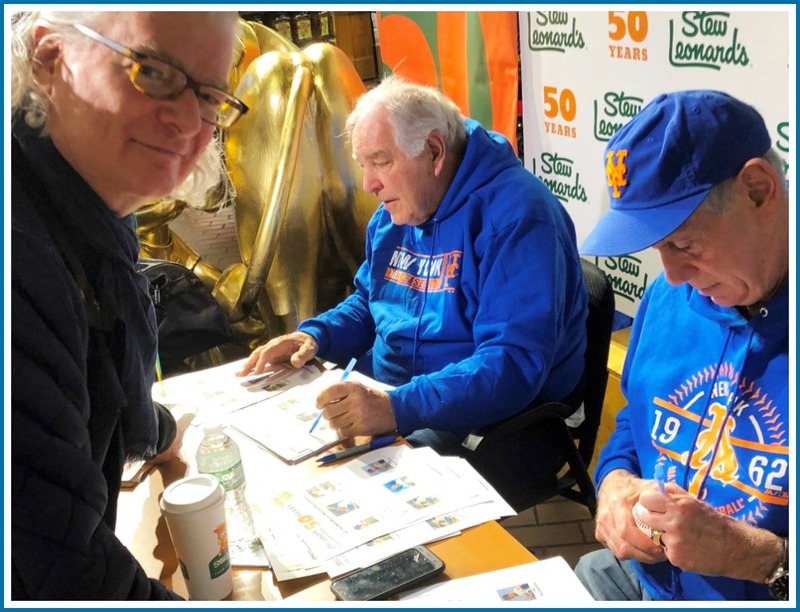 To honor the 50th anniversary of the Mets’ championship season, Stew Leonard’s announced that its Wishing Well charity will benefit the Alzheimer’s Association. That’s a tribute to Mets Hall of Famer and ’69 World Series ace Tom Seaver, recently diagnosed with Lyme-related dementia. This entry was posted in History, Local business, Looking back, People, Sports and tagged 1969 New York Mets, Art Shamsky, Ed Kranepool, Phil Gambaccini, Stew Leonard's, Tom Seaver, William Adler. Bookmark the permalink. Great to see Phil Gambaccini back in Westport! That’s good news! Great stuff, and I hope Stew Leonard’s will bring in Clyde and Willis et al in May of 2020 to commemorate the 50th anniversary of the Knicks’ first title. I am happy to volunteer as a player liaison. The interim soccer coach that year, Frank Henrick, was a baseball coach at Staples as well so, if he had been aware of the radio, I imagine it didn’t bother him. As for what was more likely to happen first—man walking on the moon or the Mets winning a World Series—my guess is that if you asked baseball fans that question in the 1960s, most would have answered man walking on the moon. Stew and the Mets……winners in my book! Phil Gambaccini? That guy is AWESOME! The 1969 Mets captured me as a kid and made me a baseball fan for life. And now we’re just a couple days from another baseball season. I can’t wait. Play ball! I became a Met’s fan that year at age 6. My mom would be creating her rugs with hook and needle while we would watch the miracle Met’s.